Arcade production addressed to fans of extreme skateboarding. Unlike the Tony Hawk's series, the game has a slightly more realistic approach to discipline. Production for fans of extreme skateboarding, prepared by Z-Axis studio specializing in sports games. 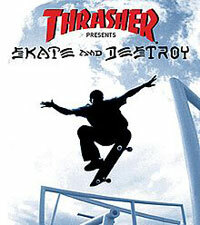 The authors tried to reproduce the reality of the competitors' struggles as faithfully as possible, thus distinguishing slightly their design from the competitive Tony Hawk's series. The basic module of fun is Skate Mode, a specific career mode in which players as one of six fictional skaters set off into the world. Their aim is to gain international fame, support the sponsors, and ultimately to be on the cover of the prestigious magazine "Thrasher". On each level, the athlete's task is to produce a specific result within two minutes. At the same time, they cannot break their skateboards or get caught by the police, who appear on the arena in the last seconds of each ride. PS1 console owners gain new items of equipment, including clothing and shoes, for further achievements. The title tries to reflect the specifics of skateboarding in a realistic way. Excessive stunts may result not only in damage to the equipment, but also in injuries to the competitor, after which it is impossible to continue the ride. Players will have access to all the most popular tricks - grinds, kickflips and rakes. Next to the basic single player mode Skate and Destroy It also allows two people to have fun in a number of competitors. Among them are competitions for the longest grind, the best scored trick or the most painful fall. Multi-person competition is possible in some challenges on a split screen, in others it is based on the rules of a hot chair. Skate and Destroy is a three-dimensional sports game maintained in a specific atmosphere characteristic of extreme skateboarding. The atmosphere of the game consists, among others, of a soundtrack with only hip-hop songs.